Some microphone preamps have variable input impedance, which gives you some extra control over the sound of a microphone. 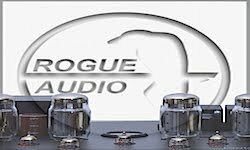 Most preamps don't, but they might sonically benefit from being used with an add-on impedance control device, such as Magneto Audio Labs' Variohm, priced at $269. Here's why. The diaphragm of most dynamic mics resonates around 150 Hz or so, and the load impedance on the mic can vary the degree of resonance, changing the amount of bass. The same is true of ribbon mics, whose diaphragm tends to resonate in the 30 Hz area. Also, a low-impedance load on condenser mics tends to increase distortion in their electronics. That might add a gritty edge to loud sounds, which may or may not be desirable, depending on the song and mix. The manufactured-in-China Variohm has a rugged, black brushed-metal chassis of half a rack width. On the front panel are an impedance-setting knob (50 ohms to 2.4 kilohms in six steps), a hard-wire bypass button, phantom-power toggle switch, and phase (polarity) toggle switch. On the back are two 3-pin pro audio (XLR) connectors for microphone input and output. Since the impedance loading is passive, there is no power needed. All the Variohm controls are big and have a solid feel; the chassis and labels are up to professional standards. The bypass switch is a useful feature because it lets you compare the processed and unprocessed signals.Inside the unit are custom-built transformers which are said to impart a great analog-like sound to the mic signal. The Magneto Audio Labs Variohm is a well-built, new tool for tweaking the tone of microphones. It's especially helpful when used with mic preamps that might sound too neutral or colorless. You connect a microphone to the Variohm's mic input, and connect the Variohm's mic output to the input of a mic preamp. In other words, you insert the Variohm in series with the microphone's signal. The following preamp can be stand-alone or part of a mixer. 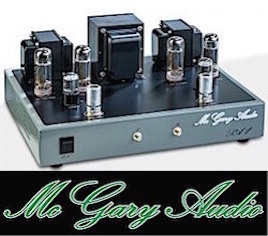 Note that the Variohm does not supply phantom power; it passes it on to the microphone from the following preamp. I connected the Variohm to a PreSonus Firestudio project audio interface, which in my opinion, has accurate, transparent mic preamps. It's transformerless and has an input impedance of 1300 ohms. Dynamic Mic (Shure SM57) 200 ohms — Slightly thinner around 150 Hz and 4 dB lower level on all instruments and voice. 50 ohms — Slightly thinner around 150 Hz, 5 dB lower level, and slightly less extreme highs above about 8 kHz on all instruments and voice. Ribbon Mic (Cascade Fat Head) 200 ohms — Slightly less deep bass and 6 dB lower level on all instruments. Toms became less powerful. 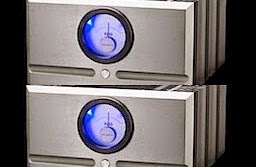 50 ohms: Slightly less deep bass and 12 dB lower level. Toms became less powerful. Guitar and cymbal became less "thumpy," making them more realistic, in my opinion. 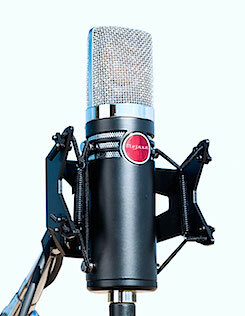 Condenser Mic (Neumann KM 184) 200 ohms — 4 dB higher level, no audible tonal change or distortion on all instruments. 50 ohms — 4 dB higher level, no audible tonal changes or distortion, except that loud voice became more tubby in the lower midrange, and seemed to lose some extreme lows and highs. Quiet voice was unaffected. 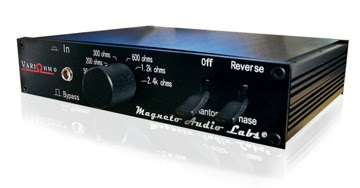 The Magneto Audio Labs Variohm is a well-built new tool for tweaking the tone of microphones. It's especially helpful when used with mic preamps that might sound too neutral or colorless. With some mics, you can achieve nearly the same effect with EQ, but there are subtle differences between the Variohm and EQ that may give the Variohm an advantage —especially when driven hard so that the transformers start to saturate. (As the company slogan says, it's "analog warmth for a cold, digital world"). 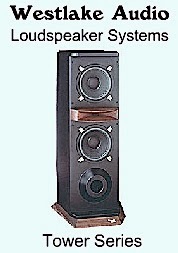 Many performers, home recordists and professional audio engineers like the saturated, analog sound. As with EQ, compression and so forth, the desirability of variable mic impedance’s effect is going to depend on the preference of the one who hears it. AES and Syn Aud Con member Bruce Bartlett is a microphone engineer (www.bartlettmics.com), recording engineer, and audio journalist. His latest books are "Practical Recording Techniques — 5th Editiomn." and "Recording Music On Location." With any audio processing, the result’s satisfaction quotient is in the ear of the beholder: EQ, compression, limiting, phase adjustment, etc., are all subjective. One guy’s sonic treat is another guy’s ear splitting headache. That is why I like the Variohm, its effect is enough to change the sound — with the right mic and preamp — but not so over the top to be annoying. I see it as an effects pedal for microphones. I played around with the Variohm quite a bit in my home studio and was able to dial-in sounds that I really liked. My best result was when I used it with a TASCAM HD-P2 flash recorder with built-in mic preamps. I wanted to record this old Fender solid state guitar amp that had a kind of cool-sounding, etched midrange, but it was a little harsh. I wanted the emphasized midrange sound without all the hard edge. To record the amp, I settled on a dynamic mic, the Audix i5. I set up the recorder/preamp to 24-bit, plugged the mic cable into the Variohm and then its cable plugged into the TASCAM. After playing around with the settings, I dialed in 50 ohms and the result was softer, somewhat bigger sound with a warm bass and near total elimination of the harshness! It had an effect almost like analog tape saturation. I tried the same audio without the Variohm, running it through a Mackie Mixer and and just rolling off the EQ. 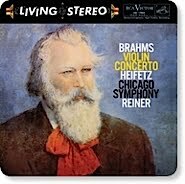 The Variohm version sounded better to my ears. Less muffled. Overall, I was impressed with the Variohm. Need stereo, buy two. They are inexpensive. Impedance changes for a microphone may not always make an audible change, but the Variohm is another processing tool for your recording bag or rack. And unlike an effects pedal, it does not need a battery. ©All original articles on this site are the intellectual property of the Everything Audio Network. Any unauthorized use, via print or Internet, without written permission is prohibited.